The outdoor experts at the Appalachian Mountain Club share their knowledge and the tradition of New England backpacking in this new edition of Best Backpacking in New England. Whether looking for an introductory overnight trek or a more challenging multi-day excursion, backpackers of all levels will find hikes suited to their interests and abilities. Appealing to both visitors to and residents of New England, this guide includes helpful new features like GPS waypoints for parking lots, fully updated trail descriptions accounting for recent rerouting and trailwork, and new topographic maps designed to help plan trips. New trips include the New England National Scenic Trail, Carrigain Notch-Mount Carrigain Loop, Grafton Loop Trail, and more. With photos for each trip, this reliable guide to low-cost adventure will have hikers exploring some of the wildest, least-traveled trails New England has to offer. Matt Heid is author of several hiking and backpacking guides, and is a regular contributor and blogger for AMC Outdoors. He leads trips and teaches classes in outdoor photography, natural history, and navigation. 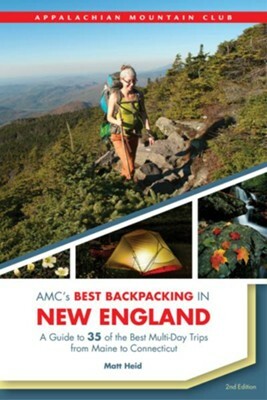 I'm the author/artist and I want to review AMC's Best Backpacking in New England, 2nd Edition: A Guide to 35 of the Best Multi-Day Trips from Maine to Connecticut.